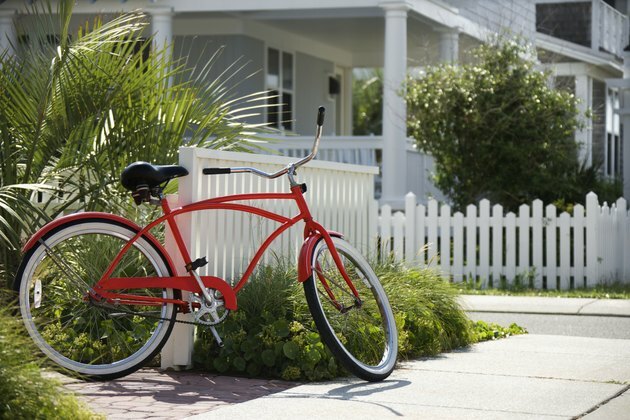 Your cruiser bike is an ideal ride for city streets and rolling bike trails. Deciding whether or not to spring for a seven-speed over a single speed cruiser depends on where you plan to be riding. Seven-speed cruiser bikes use a derailleur to change the gear ratio between the chainring and the cassette, which makes it harder or easier to pedal at different speeds. A low gear decreases torque, so it's easy to pedal, but you'll lose speed. A higher gear makes it harder to pedal, but greatly increases your speed. A single speed cruiser bike has no derailleur; instead, a single gear in the back wheel and the chainring give you a single-gear ratio. Single speed bikes are simple, with no moving parts that require adjustment. This makes them extremely reliable and ideally suited to commuting around a flat city. However, since you can't shift into a lower gear for hills, you'll have to use a lot of energy to climb any inclines. Depending on where you ride, a single speed can be more than enough, but any hills will make riding a bit of a challenge. A multiple-geared bike like a seven-speed cruiser has a lot more range than a single speed bike in terms of your pedaling. Because you can shift into lower gears for uphills and higher gears for downhills and flat roads, you'll have a much easier time negotiating changing terrain. A derailleur does require periodic adjustment, because the cables that connect your shifter to your derailleur stretch and wear out over time. This minor inconvenience is usually worth the trade-off of being able to conquer hills if there's a lot of incline in the areas you cycle in. Honey Bicycles: Why Ride a Singlespeed?